Each strip card data has been written at the factory, there are three tracks on the magnetic strip. Track 1 and Track 2 is read-only track when using the information recorded on the track only allowed to write or read and modify. Track 3 is a track write, read, in use, can also be written. Track 1 can record numbers (0-9), letters (A-Z), and other symbols such as brackets, separators, etc., the maximum recorded 79 numbers or letters. Track 2 and 3 characters recorded only numbers (0-9). Track 2 recorded maximum 40 characters 3 tracks recorded 107 characters maximum. 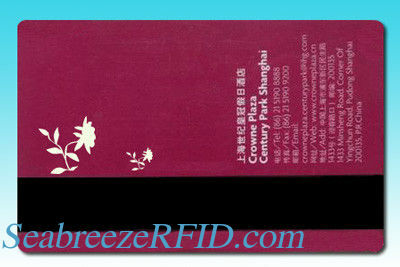 Magnetic strip hotel door cards is printed with instructions prompt information, such as card direction; the other side there is the magnetosphere or magnetic strip. strip is material ( also known as pigment ) directed by the arrangement of the iron oxide particles are composed of a thin layer. Bonded together with a resin binder closely and adhered to the paper or plastic such as a non-magnetic substrate media. Magnetic strip cards are generally used as an identification card, you can write, store , rewrite information content, is characterized by a strong reliability record data density, misreading low input information, read speed. Magnetic strip card reader since the information is relatively simple and easy to use, low cost, and thus the development of early access and enter a number of applications. Magnetic strip color optional: black, brown, red, etc. Other applications: supermarkets, shopping malls, finance, banking, taxation, finance, telecommunications, communications, transportation, tourism, health care, insurance, education, beauty salons, clubs and so on. Security features:Laser ablation,Hologram/OVD,UV ink,hidden barcode/barcode mask,Graded Rainbow,Micro-text. 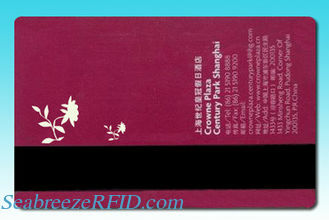 Others: Signature panel,barcode, Serial number,embossing,Encoding,die-cut. Declare: The showing picture is only for reference of our product.All related to intellectual property rights of trademark are belongs to trademark company.